Hi, I love the site, very informative. I haven't been able to find an answer to my question yet though, So here it is. I purchased an angelfish from a lfs which I have always heard of as having a pretty good reputation with hobbyists so I didn't think too much about it in the store, but now that's it is home I am thinking about it constantly. The problem is the fish I bought has brown/black spots along its sides and some spots that look almost like holes on its face. Otherwise the fish is pretty normal. It's kind of shy but doesn't hide all the time, it has been eating, and it's colour looks good. I don't think it's a colour locus (if that is the word) that comes naturally with the fish because when he gets startled or whatever and he loses his stripes the dots remain. According to the fish store the father was wild, and the mother was tank raised and the fish is supposed to be a altum/scalare cross, which is another reason I was willing to take the risk. To make matters worse I don't have a quarantine tank at the moment, so I've exposed him to the other fish in my 70g. the dots are just that, dots. It doesn't look like they are breaking the skin and not protruding or anything. I also read in another article on your site that there are wild parasites that can exist in the fishes skin but don't harm it or leave the fish without being eaten by another animal etc so I wonder if they could be something like that. The marks on the nose are a bit different, they aren't really protruding but they look a little different almost like the go further in or something. To me they look more like holes but it's hard to tell. I have included some pictures to help, although the quality isn't the best. In your experience what do you think it could be and what steps should I take now that I have stupidly exposed my tank? Thanks! Mr. Pictus, here, has come down with something. This does not look like run - of - the - mill Ick, to me. with it. This is the best pic I was able to get. Most likely this has been stress induced. Last week I moved him to a different tank. Tank mates were 4 Checkered Barbs and a pair of Jewel Cichlids...The infamous Rhett and Scarlett. The Barbs were the first to go in...left for two days, then Mr. Pictus was put in and left for two days, then Rhett for two days, then Scarlett. When Pictus was put in he never quite settled in. Instead of cruising he was zooming. I had him in there for a week and couldn't take it anymore so I put him back in the other tank. He zoomed for a day then went in his log and seemed ok but yesterday he looked exhausted. He just rested his head in a branch opening and had short but rapid breathing...not right for him. Last night I moved his log to have a look see and found him covered in this. I moved him to the med tank. He had also broken his long whisker. The whisker looks like he snagged it on something because it is slightly bent at the point of the break. If he makes it will it grow back? so how should I proceed. I was trying to re-create the original conditions of when Rhett and Scarlett were breeding. BTY, New 55 gallon, Carib Sea Instant Aquarium substrate, Established Emperor 400 HOB filter. Params ammonia and nitrate - 0, nitrate - trace, PH - 8. Thanks again ! You guys are the best ! Mr. Pictus's whisker doesn't appear to have any rot but is just bent slightly at the point of the break. I kicked up the heat in the med tank where he is by himself. Though I am still unclear as to do I use salt or not...just heat ? There is sooo much to read and Mr. Pictus is in such bad shape. He already went belly - up while I was waiting for your reply. I turned him right side up where he still is. This advanced stage came up very fast as he was clean when I first put him in the new tank and clean when I put him back in his old tank. ( I would not have put him in the main tank if he showed any signs of Ick ! All of these fish had been together last fall ( Pictus , Checkered Barbs and the Jewel Cichlid pair ) until the Cichlids babies hatched on New Years Day. I took Mr. Pictus out a few days after the babies started coming out. I pulled the carbon and put some QuICK Cure in the tank with the Jewels and Barbs. I am going to hang loose with the main tank but will watch it very closely. > I read your reply with interest. I was going to answer that one, and felt it looked like Costia. Guess I'd have been wrong. > I am confused by your comment about not using salt with Pimelodids. How can you treat Ick with just heat? I didn't think that worked. For what it's worth, quite a few Pimelodids enter brackish water in parts of their range, including Pimelodus blochii and Brachyplatystoma vaillantii, so I don't think the necessarily low salinity is likely to cause harm. Certainly no more so than with clown loaches or Mormyrids, where you'd use salt rather than copper. More observations on the broken whisker. It has been changing rapidly in the last 24 hours. I can clearly see the rot now and earlier this morning the other whisker began to rot as well. Sorry to report Mr. Pictus has expired around noon today. seeking the pellet. He has a good appetite and appears to be doing fine. He has a very small territory. Seems to be no more than a 6 " range from his shady plant. Of course I don't know what he does when the lights go out but he's close to his plant the rest of the time and not afraid to come out at chow time. I have several niggling health/parasite problems in my freshwater aquarium. I have done much reading, much sifting through the WWM FAQs and related articles, but I fear that now the information I have gathered is beginning to diverge rather than converge, and was hoping that you might be able to provide guidance on my next steps. My main concern is an aged Bolivian ram. I acquired this fish when it was fully grown a year ago. 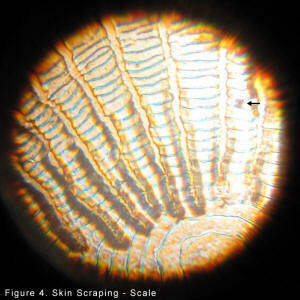 Its symptoms are flashing (focusing on the gill area), darting, shimmying, and flecks on its eyes. Sometimes its skin looks a little shredded -- white lines from the back of the head along the flank, as if it has been cat-scratched. But then this last symptom will suddenly disappear, the flashing will calm down and I am tempted to think that it has got over whatever problems it has. Except they return. Concern number two is the five Corydoras sterbai in the tank. They will flash against the substrate. These were new fish added in the second month of the tank. One of them has always had a white dusting on each flank (which I didn't notice in the shop), and a stumpy, Nemo-esque pectoral. This dusting is not Ich, and does not seem to change or shift. But they are all feeding and growing well and otherwise happy. Problem number three is a very old Otocinclus that occasionally 'furs-up'. Every two months or so it looks as if it is in the last stages of a fatal illness -- and then the next day any sign of it has completely gone. Perhaps some sort of mucous excretion here? The other three Otocinclus are fine, fat and have grown very well. Problem four is my shoal of cardinal tetras. They have been with me for over two years now, but currently seem to have some sort of grey-white bean-shaped (like a tiny grain of rice) parasite that sits vertically on their flanks. They flash now and again, presumably to try and dislodge whatever these things are. The suspected oldest fish of this shoal is the worst affected. It is a similar case with the marginatus Pencilfish that I acquired (about the same time as the C. sterbai) -- the same tiny flattened rice/bean on their flanks, almost as if they have swapped one of their scales for a discoloured one. Could they have in fact lost scales for some reason from an invisible parasite, rather than the mystery bean shape being the parasite itself? Other inhabitants that are unaffected are 2 glass blood-fin tetras, 10 Boraras brigittae and 1 female Apistogramma trifasciata. The tank is also home to 2 Nerite snails, Malaysian trumpet snails, 'small pond snails', Amano shrimp, cherry shrimp, and other unidentified shrimp. I must point out that the ram, the cardinals and the blood-fins had a similar parasite in a previous incarnation of this tank. When I added the sump, I was able to isolate them, cook them at 30'C and treat heavily with copper. Whatever it was appeared to clear completely. However, all plants were transferred to the new tank (despite sitting in a bucket for a week with a double dose of copper treatment), as were the shrimp, who spent time in a separate tank with the micro-Rasboras (who appear completely immune to whatever this is). Perhaps this parasite survived either via the plants, or the shrimp. Problems started again before the micro-Rasboras were added, so they can be excluded as the main cause. I must state that I do not believe this to be a water quality or husbandry fault (apart from a lack of quarantine on my part, mistakes in transference etc). To repeat, I have never tested anything amiss in this tank, and all species should be fine within the water parameters, and with each other. There is no overt aggression in the tank. I think I introduced new pathogens either by not quarantining new stock (which I certainly will in future), or letting old ones ride in on the shrimp (or in the shrimp). So unfortunately these parasites are there now -- but can you help me ascertain what they are and recommend a course of action? Already I have raised the temperature to 29'C (84'F) and have added a UV sterilizer, although this does not appear to have made a significant impact. From my research so far I'm thinking that it could be Costia, Chilodinella, Icthyobodo or some sort of fluke, or a combination of these -- but quite honestly I don't have a clue. I have not yet added a treatment, as most of them look to be shrimp-killers, and to be frank, apart from a bit of flashing, the fish have been generally fine. But obviously I wish to eliminate the pathogens from the system, and the ram's discomfort is evident enough to now be worrying. and finally the last resort of 4) resorting to a formalin and copper-based medication. Other options I have considered are moving the shrimp to a spare 40L tank and treating the main tank. However, what would I do with the shrimp then? How long would they have to be in isolation to be guaranteed parasite free? Alternatively, do I cram all the fish (if I can catch them - Sheesh I do not look forward to that afternoon) in the 40L, blitz them with heavy meds and leave the main tank and shrimp fallow? Would this work or will the pathogens hide in the substrate? This tank will one day become a reef tank, so avoidance of copper in it would be preferable. Any insight you can offer would be much appreciated. I apologise for the length of this query. Let me finish by saying that WWM is by far the number one web resource I know of for problem solving - I have used it to research two unrelated issues already, with excellent results. Your generosity with time and information is, quite frankly, no less than a credit to humanity! So big thanks. Thank you for your excellent, attentive response. I am enlightened on several issues, and corrected on my diseases! I hope you don't mind me coming back at you with a couple of points/queries. Firstly, I've read your article on salt use, and I will give it a try, on the basis of treating velvet. For optimisation, I assume I keep the UV sterilizer on at this stage? Secondly, I did not know that Otos could go that way. I have not observed this behaviour (despite occasionally observing the tank at night with my rear bike-light), but will remain vigilant. When this condition was previously 'cleared' the Otos were in the same tank as everyone else - so I think they might have an alibi on this one. 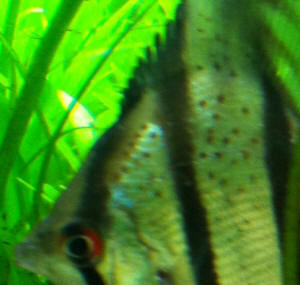 Thirdly, I am sorry to say that today I noticed that both the Apisto and the blood-fins have now started flashing. I am certain that they try and scratch their gills. All of them - they are all trying to scratch their gills - it is gills, gills, gills - this I would strongly bet on. So from what you wrote I would assume that you would think this is indicative of either a) ammonia b) a toxin or c) velvet? I feel confident I can discount ammonia - as soon as a problem arises my tests kits get used - sometimes several times a day, sometimes late at night. I use different test-kits, and have the water tested at different fish shops. Never anything amiss. Regarding toxins, I (and my family) are very careful around the tank, concerning cleaning products etc. I would have thought that if there was a toxin in there, all fish would be immediately irritated, rather than this progression of irritation, that is currently leaving the micro-Rasboras unaffected. <Yes and no. For example, air-breathing fish (like Corydoras) are going to be more sensitive to airborne pollutants than other types of fish. Then again, some fish are intrinsically more resistant to poisons than others. When I added the fish back to the tank (after their stay in a holding tank where they were treated) there was no sign of any flashing for a few weeks - possibly even nothing before I added the C. sterbai. Is there any other avenues I could pursue to discount a toxin being a problem? I worry there isn't. As a long shot, could smoking (in the garden) and then feeding fish somehow put toxins into the water? But again I would expect a non-gradual progression of irritation - blanket irritation if you will, rather than this flashing behaviour moving slowly from fish to fish. What do you think on this reasoning? So I will try the salt approach at 2g/l. While I have you Neale - this is probably a no-brainer, but do I go with cheap table salt, or should I give them some Maldon? 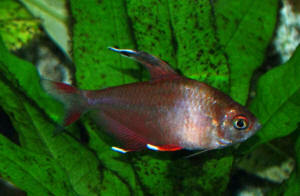 Please see photo of my rosy tetra, attached. As a follow up to my last email (below), I'd been having concerns about my Rosy Tetras. Since then I've been watching and have seen no bullying, the three have been hanging out together and eating well, though still their colouring was lighter than usual. Last night all 3 seemed okay, all ate and were swimming fine. This morning one was dead, with a thick white band on its body. I looked at my other two and am upset to find that a second looks like he is in bad shape. He has a white band as well (see photo). It is also protruding but that is hard to tell in the photo. He is swimming but didn't eat today. I am also starting to see what looks like the start of a white patch on my third though not as advanced. He is eating and swimming fine. My other fish are showing no signs of this thankfully. I have a 4 gallon quarantine...should I move both fish to it using cycled water and filter medium, and if so, is there anything you can suggest I do to help them (temperature, medication?). Any idea what this is? And should I move both of the tetras (concerned about bullying in such close quarters by the healthier one). <I'd destroy any sick fish that aren't feeding; they're unlikely to get better. I do weekly water changes, Nitrite and Ammonia are 0 and Nitrates are between 8 and 10. As below, it is a 20 gallon tank. P.S. One thing I noticed is that my tank temperature has gone from the usual 78 to 75, though I would have thought this might help since they like cooler water. I am trying to regulate the temperature now, as this fluctuation has never happened before. <Can't see relatively small temperature changes like this causing problems. Well, things have gone from bad to worse. Since writing the email below on Saturday, I've lost all 3 of my Rosy Tetras but it doesn't stop there. When I came home yesterday one of my red phantom tetras seemed to have pop eye in his right eye, just starting. I watched every fish closely last night and everyone ate and was full of energy, even him. also find a dead swordtail - again, 100% normal and pushing his way around to get food last night as usual - very active and nothing unusual on his body. Now two of the four remaining tetras appears to have pop eye. The other two seem okay. I have two remaining black skirt tetras that appear okay. Six Cory catfish appear fine, one (Elegans) is appearing sluggish tonight. My Farlowella and 5 little Oto cats seem okay. I did my weekly water change last night because I was concerned about the pop eye, tested water levels an hour later and they are still great. Ammonia 0, Nitrite 0, Nitrates around 8. That is constant for my tank. Water temperature did not change, and I used chlorine remover in the water as always. It hit me that a while ago I introduced 2 elegans Corys to my tank. One was lethargic from the get-go, the other was very active but died two days later. I had assumed at the time they died from the stress of travel. I think what I've learned is a very painful lesson in not quarantining, unless there is something else in my water that I should test for. I also introduced a plant about two weeks ago but not sure if that can cause problems? Please help...I know that I will likely loose more fish by tomorrow if not sooner. Should I medicate the tank, and if so with what? I am very concerned that medication will hurt or kill my catfish (cories and Farlowella). Thanks as always for any help you can provide - I am at a loss. 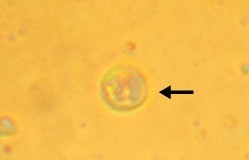 <These sorts of infections are rare but always frustrating. I can't begin to tell you how many Neons I've lost (or seen others lose) because of Pleistophora hyphessobryconis. For all my (supposed) skills at fishkeeping, Neons are the one species I've never been able to maintain. In other words, usually what happens is you let the infection burn itself out, removing any infected fish and adopting a wait-and-see approach towards the others. Sorry, a bit more info if this will help. I checked PH just now and it is right where it has always been (in the "ideal" range). I don't know what else to test - everything is fine. I think my Elegans is okay, as he is active now. I might have caught him during a rest. My two red phantoms definitely have pop eye but are active. I have noticed the one who had pop eye last night seems to have it a bit worse today. I've just examined every single fish and there is not a single symptom I can see. No loss of colour, fins are not clamped or torn, no white spots, no fungus. Nothing is visible other than the two with pop eye. All are active and eating. That is also how it was last night which is why I'm shocked that my sword and tetra, who appeared in perfect condition and were active and feeding were dead today. I should also mention that none of my fish was dead for very long, in fact most of them that had died in a breeding trap. If one looked bad in the evening I would place him in the trap so the others couldn't consume the body in the event he died overnight. I had hoped this precaution would prevent any further contamination. Finally, my tank is well established and I have had no real problems with water quality or fish loss in the 2+ years it has been running. I hope this additional can help you help me! Thanks again for your thoughts. As expected, when I checked the tank first thing this morning I could barely tell apart the 4 remaining red phantoms from the 2 black skirted because all have lost all colour. They are essentially transparent now. I have moved them to another tank. I've noticed that the tail of my remaining sword has a tiny little bit of raggedness on the tip (barely visible) which wasn't visible last night so I'm watching him closely. Otherwise he was happily devouring a catfish pellet this morning and was active. Thankfully all cories, the Farlowella and the Oto cats seem great, in fact they seem to be enjoying the new-found space. The only positive in this is that the fish seem to be succumbing very quickly - it doesn't appear to be a slow decline so hopefully they aren't suffering too much. One question - should I be doing 10% water changes more frequently than once/week to try to remove the pathogens, or keep to the weekly schedule? Even though the news isn't great, your support is very helpful. I'll focus now on hoping the remaining fish survive. During the past couple of months, one of my tanks has been experiencing numerous fish deaths resulting from what appear to be bacterial infections. The first to succumb was a White Cloud (Tanichthys albonubes). The next five were all Threadfin Rainbows (Iriatherina werneri). The symptoms would begin with a small whitish spot on the body ringed with red, then over the course of 7 - 10 days, the spot would spread, and I would begin to see bright red streaks around the eyes, gills, and/or base of fins (which I believe is a sign of septicaemia). I also occasionally saw stringy white feces on some of the fish. At this point I would euthanize the fish with clove oil, but on a couple of occasions the fish died on their own. The deaths occurred one after another, not concurrently, with usually a couple of weeks between deaths. At the first sign of infection, I would transfer the ill fish to my 10-gallon hospital tank, and, since I don't have much faith in antibiotic baths, treat with either Metronidazole mixed with food, or Jungle Anti-bacterial Medicated Fish Food (Sodium sulfathiazole 2.3%, Nitrofurazone 0.13%). (The fish were still eating well during the first week or so after infection.) This treatment had no effect. I realize that most bacterial infections are a sign of poor water quality, and this has me puzzled, because I am fussy about my fish. The Threadfins were even spawning within days of getting sick. -Hardness (my KH/dH test kit is in the mail, but according to our City's water quality report, the water is very hard). -Remaining tank mates: 3 Black Mollies, 5 Dermogenys pusilla, 5 Cherry Shrimp, 1 Threadfin Rainbow (the last one), 1 White Cloud (also the last one), 1 Scarlet Badis. -15% weekly water changes (I don't do the usual 25% because of the Halfbeaks' sensitivity to water chemistry changes). I thought perhaps a parasite was responsible for making the fish vulnerable to bacterial infections. I do on occasion see the fish flash, although oddly, never the Threadfin Rainbows. There was never any sign of Ich or Velvet. So I pulled out my old microscope, and took skin scrapings and gill samples of three of the deceased Threadfin Rainbows. Since I really had no clue what I was doing, the results of the first two fish I examined were "inconclusive." However, by the third fish, I felt I had enough practice to get an acceptable wet-mount and take a few rudimentary photographs. I would really appreciate it if someone could take a look at the attached photos and determine if there is anything suspicious. I have placed arrows near things that look suspicious (to me), but I have no experience with this and they could well be normal microscopic detritus. Please note that my microscope is a very inexpensive unit, and probably not very good, and I took the photos with my digital camera stuck up against the eyepiece, so the quality of the micrographs is not great. If you have any tips to pass along to improve my microscopy skills, that would be great! Thank you so much, and thanks to all the crew members who take the time to help aquarists and their charges! I suppose that one cell does rather resemble Ichthyophthirius. That would explain the flashing. Is there a strain of Ich that can cause a low-level, long term (2+ months) infestation, and would the Ich be hiding in the gills? I've always assumed if Ich was left untreated, the fish would rapidly become covered with parasites and die. Although I have read that fish previously exposed to Ich (which almost all my fish were when I first acquired them), have some resistance to it. I plan to eradicate the Ich using the salt/heat method, then convert this 40-gallon tank to low-end brackish for the Mollies, Halfbeaks, and Cherry Shrimp. I can move the Scarlet Badis to my heavily-planted 10-gallon (which houses one male Betta splendens and one rogue baby Molly who was banished here because she insisted on pick, pick, picking at my Halfbeaks). I'll then re-home the Threadfin Rainbow and White Cloud with other aquarists who already have schools of these. Then, Neale, I'm going to order your "Brackish Water Fishes" book and decide on a shoaling fish and maybe a few little oddballs for my brackish tank! I will follow your advice and quarantine for a month (I usually quarantine for only two weeks) and treat as for Ich with heat/salt. Neale and Bob, thank you so much for your reply. <<I agree with Bob here. I simply don't believe the old story of Ick "lying dormant" in the gravel for months or years, and then suddenly attacking. I plan to eradicate the Ich using the salt/heat method, then convert this 40-gallon tank to low-end brackish for the Mollies, Halfbeaks, and Cherry Shrimp. <Should work grand. Only a very low salinity is required, 1.002 to 1.003, and you'll find virtually all plants will thrive under such conditions. I can move the Scarlet Badis to my heavily-planted 10-gallon (which houses one male Betta splendens and one rogue baby Molly who was banished here because she insisted on pick, pick, picking at my Halfbeaks). 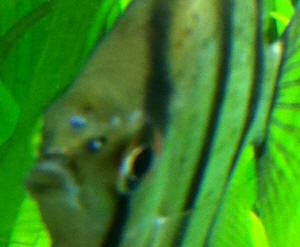 I'll then re-home the Threadfin Rainbow and White Cloud with other aquarists who already have schools of these. Then, Neale, I'm going to order your "Brackish Water Fishes" book and decide on a shoaling fish and maybe a few little oddballs for my brackish tank!